Deputy Chief Minister Chowna Mein on Monday refuted allegations labelled by Congress state President Takam Sanjoy that the eviction drive along the Chandranagar to Pappu Nallah four lane National Highway was not being carried out in an appropriate manner and announced that the same would happen on full force within a week. Addressing media persons at his office conference Hall at AP Civil Secretariat here today, Mein said the government in its cabinet meeting on October 8 had decided to carry out the eviction in one go. The requisite land compensation was already paid to the land owner outside ROW. The administration would now start the eviction drive in full force and make sure that all the buildings and establishments that fall within the Right of Way (RoW) would be cleared. “Besides the overall land compensation of around Rs 42 crore, the government also paid an incentive amount of Rs 8.5 crore to the building owners who wanted to self demolish their buildings and structure but the same has not been maintained and was not done properly,” said Mein. The DCM further also clarified that the width of the four-lane highway shall remain 30 meters all throughout the stretch of Chandranagar to Pappu Nallah. Sanjoy had earlier alleged the government and district administration of not maintaining a proper RoW and demanded the 4 laning to be done as per the strip plan. Speaking on compensation to be paid to the owners of those buildings which were partially damaged in the eviction process carried out earlier as demanded by the Congress leader, Mein said that the same was not required as the demolished portions of those buildings fall in the RoW and was not actually required as per land strip plan. “Why should government compensate people for its own land? As the land belongs to government. questioned Mein. 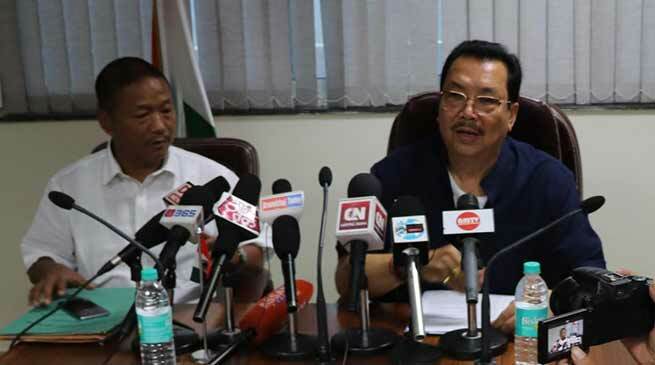 In terms of the demand raised by Arunachal Pradesh Students’ Union (AAPSU) and various other organisations for the removal of Capital Complex Prince Dhawan for his alleged involvement in misappropriating land compensation funds, Mein said that question of removing the DC does not arise over some mere allegations and the same has to be proved after investigation. Pressing their demand for the transfer of DC Dhawan, the AAPSU had on October 15 organized a protest rally from Akashdeep to Tennis Court. Speaking on the construction of Potin to Bopi TAH which ran into rough weather again due to land compensation scam, Mein informed that the fact finding committee constituted to look over the matter has submitted its report to the government and construction work along the particular stretch of road would start soon after the stretch of road is handed over to the PWD for further formalities. The Special Investigation Cell of the state’s police had on July this year arrested former Lower Subansiri deputy commissioner Kemo Lollen, the district’s former land revenue and settlement officer Bharat Ligu and businessman Likha Maj for their alleged involvement in awarding compensation. Many stretch of road from Potin to Pangin is being cleared and the work would began soon. Mein said. He said that the allegation was politically motivated and there is no iota of truth, the Pema Khandu led government is maintaining transparently and all work will be done in very transparent manner. Mein added. He further said that the matter of package B & C from Papu Nallah to Banderdewa is also under progress with the Ministry and hope that it is approved soon so that the formality for the work is also take up systematically. IPR Minister and Government Spokesman Bamang Felix, Secretary G S Mena, S K Jain, PWD Highway Chief Engineer Toli Basar, DC Capital Prince Dhawan among other official of Highway department were present on the occasion.